Millions of drinking water supplies in Bangladesh are contaminated with potentially lethal levels of arsenic. This discovery in the late 1990s sparked widespread international concerns and generated a substantial amount of funds. Yet, after more than a decade, the provision of safe water supplies and accessible arsenicosis treatment schemes remains inadequate. A lack of understanding of the origin and health impacts of arsenic is one of the many obstacles at the community level. 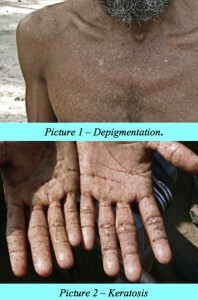 There is evidence that arsenic poisoning affects particularly the poor due to their malnutrition and low health status. Moreover, technologies and medicines for treatment are often unaffordable or unavailable to them. Interventions in the water and health sectors must not only address these inequalities, they must also be integrated. It has long been established that treatment is of no use unless people first have access to safe water. The reverse is also true; shifting to safe water is often not sufficient to detoxify the blood and organs affected by years of gradual poisoning. A safe water supply must go hand in hand with long-term medical support for existing patients. This raises serious doubts about the sustainability of many of today’s efforts. Our paper describes the challenges by drawing from our experiences working with some of the poorer arsenic affected villages in rural Bangladesh. Rammelt, C. F., Masud, Z. M., Masud, F., & Boes, J. (2011). Beyond medical treatment, arsenic poisoning in rural Bangladesh. Social Medicine, 6(1), 22-30.